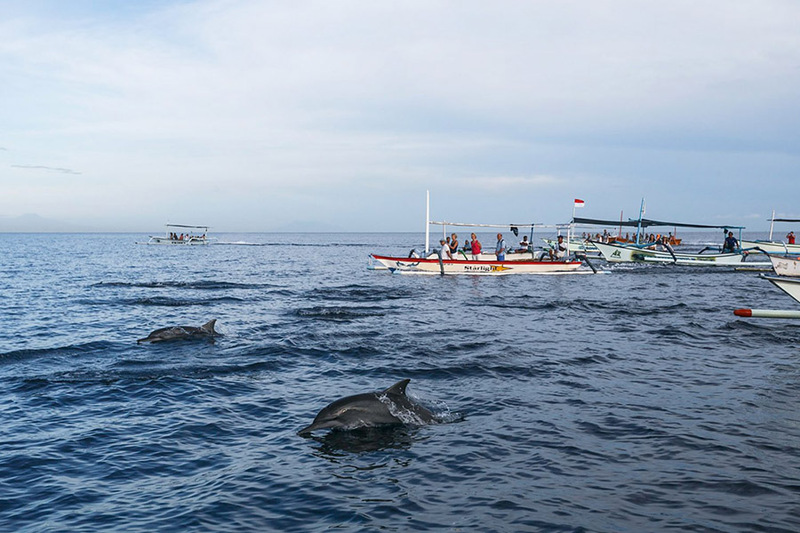 Bali Dolphin Tour is one of the best Bali Full Day Tour Packages for Hunting the Dolphin for take picture at Lovina beach during sunrise time. Lovina beach located in north of Bali islands, exactly at Singaraja regency, the beach is very beautiful and good place for snorkeling with natural under water habitat. Did you know: All Dolphins have signature whistles that are equivalent to human names. Dolphins use these signature whistles to recognize other Dolphins and they also use signature whistles to call their fellows by ‘name’. It was discovered in recent research that Dolphins are capable to recognize signature whistles of other Dolphins even after being separated more than 20 years. This is proof of the longest social memories ever recorded in a non-human species. During the Bali Watching Dolphin Tour Journey experience we will start in early morning, due the dolphin attraction we provided only do in the morning at 06.00 am, Our friendly Bali Driver will pick up at your hotel 03.30 am, and we will straightforwardly to Lovina Beach to catch the conventional outrigger boat to see the Dolphin, will take around 2 hours from your hotel to the lovina, if you still sleepy you can continue to sleep in the car and we will wake you up if already arrive. After arrive at lovina you will be welcome by our boat man and you will start to ride the traditional boat for hunting the dolphin for take picture. Due the dolphin is wild, so bit scared with appearance of human, you will need to be fast for take picture if the dolphin come to the surface, otherwise the dolphin will go down and go to the surface in different spot. The fun in this dolphin trip, is like hide and seek game, we will ride the boat and hunt the dolphin for take picture, if you lucky the dolphin will go to surface near the boat. After hunt the dolphin finish we will directly continue the tour to visit the Gitgit waterfall, in here you will see the beautiful waterfall with 30 meter high, to get to this waterfall we will walk around 500 meters (around 30 minutes), if you not very strong to walk, we can skip this waterfall. 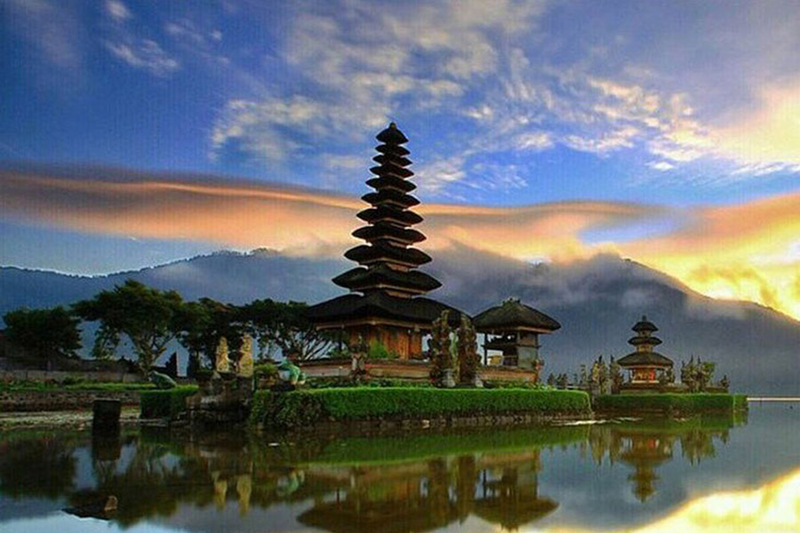 Then we continue to visit the Ulun Danu Beratan temple is beautiful Balinese Hindu temple in the lake of Beratan at Bedugul area, the temple is dedicated to the Goddess of the lake which is God Danu. Then we continue the Dolphin tour to having lunch with Indonesian food at local restaurant. After finish lunch we will directly go back to your hotel with bring the awesome memory and picture. This Dolphin Hunting Tour more enjoyable with our clean, comfortable private car and the awesome English speaking Bali Driver. Below is the description of places of interest we will be visit during this Spectacular Dolphin Tour. Lovina Beach is a coastal area on the northwestern side of the island of Bali, Indonesia. The coastal strip stretches from 5 km west of the city of Singaraja to 15 km west. It is becoming more popular with tourists but remains far quieter than the tourist hot spots of the island’s south side. The famous tourist attarction here is Watching Wild Dolphin in the beach using traditional boat. 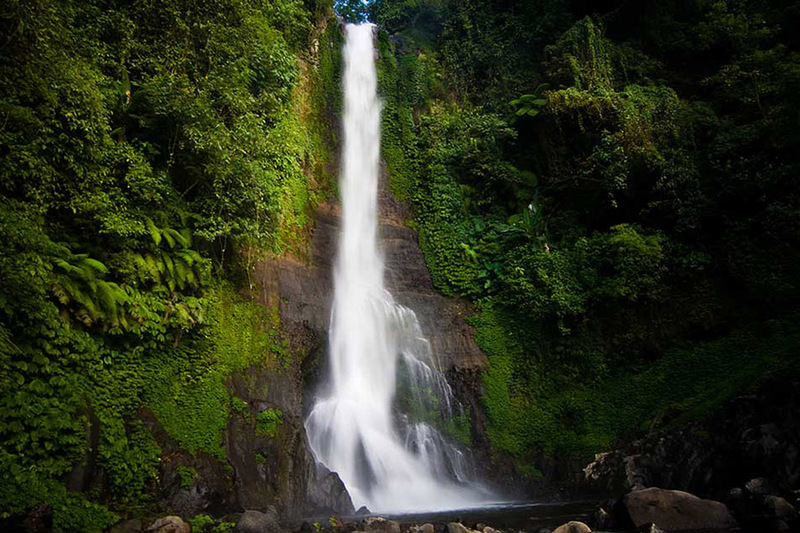 Gitgit Waterfall is a waterfall on Bali, Indonesia. It is located on the north of the Southeast Asian island, not too far from Lovina and the old island capital Singaraja. This waterfall has 30 meter high with clean and fresh water. This is a great place to share a picnic, take some time out to be quiet, meditate or enjoy a refreshing swim in one of the many pools below the falls. Ulun Danu Beratan Temple is located at the edge of lake Beratan, Bedugul area, Candikuning village, Baturiti district, Tabanan regency Bali, Ulun Danu Beratan temple is one of the most famous Balinese Hindu temple, it is also commonly called as Bali temple on the lake or Bali temple on the water because it looks like floating on the water when the water level in the lake is rising.